The fishing may be good in the Chain of Lakes in Lake County, Florida, if you are out in a boat, but it certainly is nothing to brag about when fishing from a pier (which seem to be in short supply, too). We stopped at a bait store and inquired about public fishing piers. The clerk told us about three in the area; we tried two of them. The first pier we used was probably not meant to be in use any more, since access was not immediately visible. We parked in a boat-launch parking lot, then hiked about a quarter mile, first down a sidewalk, then through a field of sandspurs. (Sandspurs are pesky stickers that really are painful when you step on them. We discovered that they not only stick to your socks, they also stick to the bottom of sneakers and then escape into carpet. Ouch!) The pier was in disrepair, with rotten boards and holes in the flooring. We took care not to trip as we walked on it. Despite all of the good worms on our hooks, we had no takers, not even a nibble. Either it was too hot, the wrong time of day, or there just weren't any fish. The next place was in a park with a boat ramp and an outlet that went to Lake Griffin. It was there that I had my luck. The first night I caught four bluegills (two keepers), the second night two. (Jim would say 1 and 1/2, since the last one I was reeling in jumped off the line before I could get my hands on it. It was so small it was going to go back into the water anyway.) We fed the fish well those two evenings. The second night, we had to leave before dark because we ran out of bait. Oh, well. 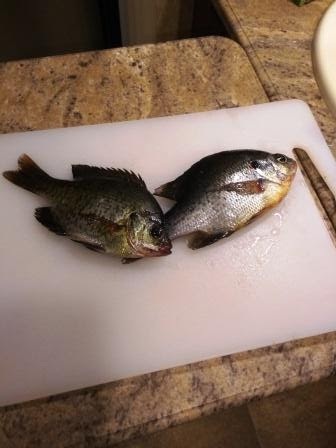 My two little bluegills await Jim's scaling knife. Yesterday (before going fishing) we also traveled out to Howie-in-the-Hills (yes, that is the name of a town in Lake County), where we visited a plant nursery. Jim had found the nursery on e-Bay and discovered that it was actually in a nearby town. We arranged to buy some plants directly from the grower instead of having them shipped to us. The grower was very generous. Jim had anticipated buying plants in two-inch pots. Instead, the grower let us have huge plants, some of which will bear fruit next season! We will have a paw-paw tree, a mulberry tree, Okinawa spinach (a purplish-colored green), three kinds of dragon fruit (pink, purple and white), a boynsenberry bush, three kinds of fig trees, a blackberry bush, and a vick's plant (its leaves smell like menthol). The grower gave us a couple of the plants gratis. As I said, he was very generous. A few of those plants are more than four feet tall! The cost: $82. After buying the plants, we decided to cut our camping trip a day short. Fishing was not great; we had exhausted touring points of local interest; and we wanted to watch our college football games on TVs with good reception on Saturday--at home. So, that is where we are. We arrived home and unloaded Thor about three hours ago. We had a great time, but there is no place like home.